Hughes Safety Showers’ wellbeing journey began in 2009 and the results that they have achieved are very impressive. Hughes Safety Showers approached Annurca after wanting to take their existing provision to the next level. The management team at Hughes Safety Showers identified a very specific set of goals including; key performance indicators relating to health improvements and accreditations. The benefits that are being experienced by Hughes Safety Showers on their wellbeing journey are wide reaching. Increased productivity, employee satisfaction, improved morale, increase in sales and development of additional overseas business are just a few of the benefits that Hughes Safety Showers have taken from their initiative. A milestone on the wellbeing journey of Hughes Safety Showers was the attainment of the Investors in People Gold accreditation. They were the first manufacturer in the North West to achieve this. The hard work and dedication of the Hughes Safety Showers team has enabled them to achieve their goals year after year. “Thank you for carrying out the Workshops and Health Screening Tests for our employees. The Nutrition and Exercise workshops run by one of your Senior Consultants were very informative and well presented. Feedback from those who took part was very positive and an encouraging precursor to the testing. We were particularly impressed with the way in which Annurca’s consultants carried out the health tests. Their time management was excellent, especially when you consider they were dealing with 60 employees in a relatively short period. Careful scheduling, with no delays, meant that the testing process ran smoothly and did not disrupt the running of our business. As you will appreciate, for a company of our size this is an important consideration. 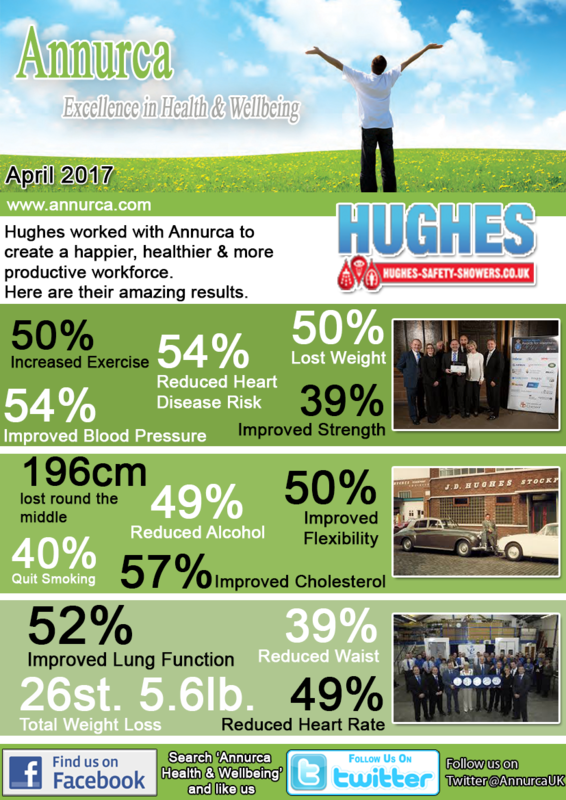 At Hughes we try to make life interesting for our employees, it’s a great motivator and, I’m sure you’ll agree can have a positive effect on general health. With this in mind, and with your help, we decided to nominate the healthiest male and female members of staff. Annurca’s co-operation was yet another example of the extra effort Annurca put in to make the whole exercise a success. The individuals selected as the healthiest were then mocked up as a `Superman` and `Wonder Woman` and were presented with a certificate and a cut-glass trophy. The culmination of Annurca’s hard work was, of course, the individual health test report supplied to each member of staff. It was certainly informative and no doubt helpful in persuading everyone to live a much healthier life. The follow-up recommended for a few members of staff went as smoothly as the initial testing and the subsequent report was very useful.